Walkerville has always been famous for two things: Hiram Walker and Canadian Club whisky. But did you know that this community was renowned for the quality of a premium beer brewed right here from 1885-1956, and then reborn in 1998? Hiram Walker was a man who never rested on his laurels. Having lived through two bankruptcies, the Civil War in the USA, a depression to rival the Great Depression of 1929, he was constantly innovating his businesses and expanding his empire. In 1885, he embarked into the field of lager making. Walker proposed to brew the finest and purest lager beer ever made in Canada from the choicest Canadian malts and hops. Like his whisky business, Walker accepted no compromise with any venture he entered into- nothing but the finest ingredients and equipment would do. 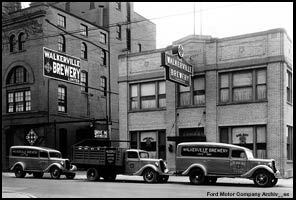 With the entire wealth of Walker's empire backing the Walkerville Brewing Company, the most modern brewing equipment of the day was obtained. A magnificent building was unveiled on Fifth St. (now Walker Road) at Wyandotte, at a cost of $180,000. Walker boasted that his brewing process, using a vacuum fermenting system pioneered by a young German named C. Pfaudler, would completely revolutionize the brewing industry. Walkerville beer would become as famous among beer drinkers of Canada as Walkers "Club" and Imperial Rye was amongst whisky drinkers in the Dominion of Canada. The five story brewery had quarry stone foundation and cement mortar 8 feet deep; the building's face was Detroit red brick shipped by the Walkerville ferry (one of many Walker owned enterprise). As described in the "Walkerville Mercury" on the opening of the brewery in August, 1890, a 12 x 30 office was located on the second floor, the brew house contained a brewing kettle with a capacity of 2,300 gallons and a room where hops shipped from Hiram Walkers farms and the United States were kept at a temperature of 30 to 40 degrees Fahrenheit. The brewery featured two 45 horse power steel boilers, along with various pumps and brine tanks, condensers for racking off beer and an ice machine that took first prize at the 1889 Paris, France World Exposition, beating over 36 other machines of its kind. The main advantage with this brewing system was that aging and storage was greatly reduced- beer could be turned out in 28 to 35 days from brew kettle to market. A two story bottling plant was soon built, along with offices for the company, two barns each with 5 stalls for the company's horses that helped deliver kegs. A spur line from the Lake Erie, Essex and Detroit River Railroad (a Walker owned railroad) was connected to the plant, enabling the company to ship beer to all parts of Canada. Although Hiram Walker remained only 2 years as president of the Walkerville Brewery before turning it over to his son Edward Chandler Walker in 1892, he guided the brewery with the same enthusiasm as all his ventures. In August 1890, the Walkerville Brewing Company produced their first brew, soon to become their famous lager- the first batch consisted of 70 barrels holding 32 gallons. By October, 1890 the brewery was receiving lager orders faster than they could meet demand. In October, an Industrial and Agricultural Exhibition was held in nearby Windsor- the brewery had an impressive exhibit of their already famous lager brew both in bottles and casks. The brewery soon established agencies in London, Sarnia, Toronto and east to Montreal, where their vacuum lager was well received. In November, the shipments began to Goderich, Kincardine, Palmerston and Wingham.